Transcript: The Full Text of Bishop Sandy Millar’s Sermon at Truro: "Do You Love Me?" BB NOTE: With grateful thanks to the incredible “pageantmaster” for transcribing the sermon from the video found here and ElfGirl for sending it to me from her undisclosed location. God bless you! http://web.mac.com/maryailes/iWeb/BabyBlueCafe/BabyBlueOnline/4A5463F8-DE51-4DB2-BE4B-C8B29EE47E1D_files/Truro%20Podcast%20Episode%20Oct.%202007.m4aUPDATED BB NOTE: The sermon is now up on iTunes. You can click on the player above or go to iTunes and download it to your iPod or computer. The iTunes Podcast is called BabyBlueOnline. You can also click here. I want to say first of all what a huge privilege and treat it is for my wife and for me to be here with you this morning. I have heard so much about you, and ah, all of it good [laughter] all of it good and we’re just so thrilled on this auspicious day. It’s a wonderful day for the kingdom, it’s a wonderful day for the church here, and it’s a wonderful day for Tory and Elizabeth and their little family. And do you know I think it is true that Jesus draws near to us at different stages in our life and different moments, always with great love as we try to battle with some of the great questions, the real questions in life, like: Can I ever be forgiven? Is there a way back? And we begin to see, sometimes dimly through our tears, Jesus being nailed to the cross. And as they drive in the nails on the one hand he takes every sin that has ever been committed and on the other he takes every sin that’s ever going to be committed – and as he hung there he cried out ‘its finished’. ‘Its finished’ as we have been singing about the last few minutes – and died. He died for you, for you and for me and the way into God’s presence became clear and open, and as we cling to the cross we hear deep down in our innermost being that whisper: ‘My son, my daughter – you are forgiven – I love you – go and sin no more – you are free.’ You are free from the pagan gods that bedevil us every stage in our lives, the gods that are no gods actually, free from the spirits that entrap you, enslave you. You are free. Key questions, not just that one of course but key questions like: Is there any point in life? What are we here for? Some years ago my godly predecessor had two very young children and he had in his house a very sweet Dutch girl who came to help them with the children and she didn’t speak very good English and the children were fighting, and she heard it from upstairs. And she went down into the room where they were fighting and she threw open the door and – there was obviously a slight scene of devastation – and she raised her voice at these children and said: ‘What are you doing on earth?’ [laughter] and the deeply philosophical nature of the question escaped the children – but it doesn’t escape us. It’s a very real question. What happens after death? Will I ever see my loved ones again? Will I see my parents again? It is questions like these and I know many of you will know that we look at on Alpha and the Alpha course. Which is of course 15 sessions over 10 weeks, and we look at the very basic questions of life: who is Jesus? Why did he die? How and why should I read the bible? How and why should I pray? Does God heal today? Who is the Holy Spirit? What does he do? How can I be filled with the Holy Spirit? Questions that many people in the world today, many people out there who won’t be in any church today at all would love to ask if they got the chance. If they could find a setting in which they were not made to feel guilty and not made to look stupid. Just a chance to ask some questions from some people who might be thought to know the answers. And as some of you will know, the Alpha Course has taken off all over the world. I can speak about it because I really just ran behind Nicky Gumbel who developed it. But it is running in 162 countries I think now all over the world because there is a hunger for Jesus. In the United Kingdom there are now 8,000 courses and it is beginning, beginning to make a difference. One of the things that I am most excited about really I think is that it is running in 85% of the prisons in the United Kingdom. I had a letter the other day from one of the prisoners who was doing Alpha. He was a long term prisoner, he has been there for a long time and other things being equal he will be there for a long time to come. But he did the Alpha Course, and he wrote at the end of the evening in back of the bible, they gave him a bible, and obviously he couldn’t immediately see a huge need for the page that covered the ‘Jerusalem in the Old Testament times’. So he wrote what he wanted to write all over that. What he said was this, the spelling is appalling. Something amazing, he wrote, happened tonight. I came back from the Alpha group and I prayed to you Lord about so much and I prayed around 20 minutes. And for the first time you felt real to me and I honestly in my heart felt your presence and you answered my prayer straightaway, because I picked up the bible and I read a large portion. But as soon as I opened it, it said: ‘we are not alone’, and it made perfect sense. You clearly showed me what to read because never before have I read the bible and understood your words. I am writing this down to remember your first words to me as I am truly touched in my heart and as I read it you need to have a personal relationship with you Lord. As I said the spelling is not good and actually it was quite difficult to read, but the theology is perfect. You need to have a personal relationship with you Lord. ‘Do you love me?’ Now there are of course two parts really to the wonderful way in which Jesus reinstates Peter in this passage. Three denials around the fire in the courtyard; three fresh affirmations, new starts around the fire beside the lake and I can’t believe again that this time with Jesus it must have been a very anxious time for Peter. He hadn’t really had a chance to talk to Jesus since that time when he had denied him. And I can’t believe that this time around the lake was ever very far from Peter’s mind for the rest of his life. The first part is his commission, his command, his call: ‘Feed my lambs’, ‘take care of my sheep’, ‘feed my sheep’, and the call of the church, the call of you Tory, the call if I may say so humbly of you, Bishop Minns, the call of me and each one of us is the same call, to find, to gather in, to take care of, to feed, the sheep that belong to God. Not just the sheep that are in here today but the sheep that belong to God out there – every single human being in the world, because they do belong to God and he loves them. But before Jesus can entrust this eternal task to Peter, to Tory, to any Christian or any Christian community and before he can entrust this task to you the people of Truro he has to know, he has to establish the basis of ministry, his ministry. We do not know who it was he was talking about with all of these. It may have been the worldly trappings that went with an established and quite successful fisherman on the Sea of Galilee: the boats, outboard motors, the nets [laughter], the allure of wealth and position, the career or the income. Or it may just have been a very simple question: ‘Do you love me more than other disciples love me?’ Whichever it was the question is the same, and the answer has to be as well. If the answer is yes, then the ministry is safe, the sheep are safe, the lambs are safe, if you love me. Now Tory, you are taking on as you will know and you don’t need me really to remind you, a very precious responsibility. Father Raniero Cantalamessa your friend and my friend, indeed the Church’s friend was a preacher to the papal household. In his book on the Holy Spirit in the life of Jesus he tells us the story of Pope John XXIII which I hope will be an encouragement to you. He says in the early days of his time as Pope he would wake up with a start in the middle of the night with many many problems on his mind, each more harassing than the last. And he would say to himself: ‘I really must have a word with the Pope about that’ [laughter]. But suddenly remembering that he was the Pope [laughter] he would say: ‘ok, and then I’ll have a word with God about it’ and he soon relaxed back into deep sleep. St Bernard of Clairvaux, the Cistercian house wrote a little paper called ‘De Consideratzioni’ which was written just about 920 years ago today at the invitation of Pope Eugenius who was elected in 1145, and he applies his lesson to the chief pastor of the church and it applies to the chief pastor anywhere. The same point was made to me recently by the Bishop of London with his usual flair for color and imagination he wants us all to remember that a priest in today’s church can very easily become like the proverbial frog in a pot of water that is gradually being brought to the boil. [Laughter] By the time that you realise the effect that the pressures of the job are having on you, bit by bit, it is too late, and you are boiled [laughter]. The call therefore is clear and what a privilege it is to leave no stone unturned, no opportunity lost, to ensure in so far as we can that everyone, all nations have the opportunity, as we in Alpha put it, to explore the meaning of life, find Jesus, get excited about Jesus and set about the transformation of the society in which we live. In the words of John Wesley, and you Tory know more about John Wesley than I do: ‘do all the good you can, by all the means you can, in all the ways you can, in all the places you can, at all the time you can, to all the people you can, as long as ever you can. But there is a second part to Peter’s reinstatement and we’ve had it read to us a few minutes ago. If the first part is the call the second part is the cross, the cost. ‘I tell you the truth,’ Jesus said, ‘when you were younger you dressed yourself and you went where you wanted’ and to paraphrase his words ‘you did pretty well whatever you wanted to do’ ‘but when you are old you will stretch out your hands and someone else will dress you and lead you where you do not want to go,’ and St John adds that Jesus said this to indicate the kind of death by which Peter would glorify God and then he said to him: ‘follow me’. And in due course, as we know, Peter was crucified in Rome upside down at his own request lest there be thought that there was any hint of comparison between his death and that of our Saviour’s. Of course today may take on any number of forms. The apparent so-called ‘sacrifices’ that go with the job. The apparent ‘simplicity’ that seeks to follow the ancient paths of holiness and loyalty to Jesus and his word against an increasing tide of the liberal agenda from within the Church that threatens to sweep us from our biblical roots and anchorage out into the sea of secularity and sin – where religion has taken the place of faith – where the Church is generally accepted and esteemed as a social agency for her work in favour of peace and social justice, but is not tolerated as soon as she starts to speak about Jesus and his gospel. As Father Raneiro recently reminded us, the same Father Raneiro, in the stories of Medieval battles including many described by Shakespeare there always comes a point where the orderly ranks of archers and cavalry and all the rest are broken and the fighting concentrates around the king, and that is where the final outcome of the battle will be decided. And for us too today the battle is taking place around the King, the person of Jesus Christ himself, in Jesus Christ the word of God, the son of God, the saviour of the world, and that is the real point of course at issue. I am as some of you know, and I am proud to be, a bishop in the province of Uganda, and in Uganda we don’t need to be reminded that loyalty to Jesus may cost your life, but in the meantime, it may cost you many other things as well. People of this parish and of this area, Truro, I have known Tory and Elizabeth and their family for, I don’t know how long, but quite a long time. In them you have, as I suspect you have guessed already a gem, a pastor who loves God and will love you. A pastor who cares deeply for all God’s people as yet not even in the fold as well as those who are in. As I was praying for you recently I felt the Lord reminding me of that story you find in Mark Ch.6 where we are told the disciples were straining at the oars, the wind was against them and the waves were beating into the boat and we are told in St Mark’s gospel that they were making headway painfully – and I thought it was the Lord’s message to you bishop and to you Tory and the people of Truro. The great thing about that story is that Jesus watched them. They didn’t know that but Jesus was on the top of the hill and he watched them as they made headway painfully. And we are told that Jesus came down the hill, it was 4 o’clock in the morning, quite late really. And he made as if to walk past them as they were in the boat and they saw him through the mist and they cried out to him and reached out for him and we are told of course they were terrified. We are told that he came in from the water, walking across the water and got with them into the boat. ‘Fear not’ he said: ‘It is I, take courage, don’t be afraid’ and then he climbed into the boat with them and the wind died down. And as Mark with his characteristic directness records it ‘they were completely amazed. I think it is one of the great understatements of the New Testament.[laughter]. I don’t need to remind you that there is a war on for the very soul of the Church. But your courage, if I may say this, humbly, and your steadfastness in the face of a new and speciously sophisticated manifestation of evil has won you many admirers all over the world. And now I want to suggest to you – it’s time to GO FOR IT. To put up your sails for the wind of the Spirit is blowing. Look after each other, look after Tory and Elizabeth, that family; and Tory and Elizabeth, look after them. The wind is blowing, and the Lord’s promise is as real today as ever it was. As far as you can, put the unpleasant things behind you. The Lord is doing a NEW THING do you not see it? There are thousands out there waiting to hear that God loves them. There is a task to be done before the Lord returns. There are millions of people to be touched with that sense of joy and peace and purpose and grace and forgiveness and love which you carry as the messengers for God. But it starts, it continues and it ends with Peter’s cry from the heart ‘Lord, you know everything’ ‘You know that I love you’. And Jesus’ kind reply ‘Feed my sheep’. Lord Jesus Christ, thank you for dying for me and for making it possible for me to be right with God and free and full of joy and purpose and love. Forgive me for the ways in the past I’ve got distracted, and I offer you myself today again for you to be my saviour and for me to be your son or your daughter because truly from my heart I want to tell you that with all my faults I do love you more than all of these. The Rt. 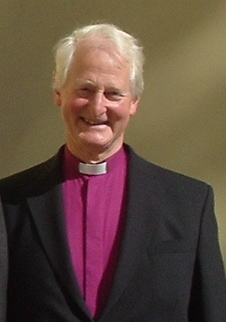 Rev’d Sandy Millar is the Missionary Bishop in London and former vicar of Holy Trinity Brompton. “A View From the Pew” video of the sermon is here.